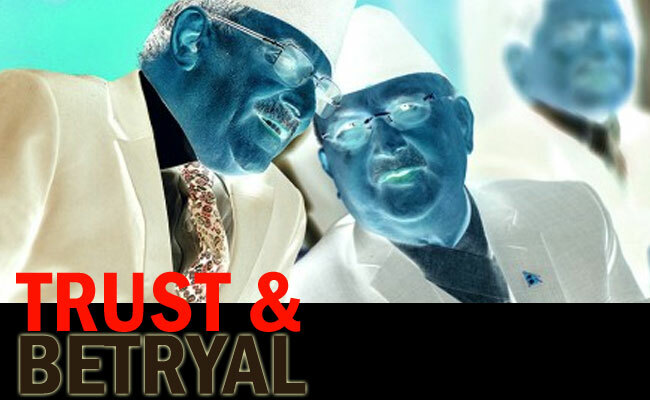 Nepal: Of Trust and Betrayal! NP Upadhyaya, Kathmandu: Lawmaker Amresh Kumar Singh, who is considered to be close to India’s notorious intelligence agency, RAW very emphatically in a recently televised interview claimed that Prime Minister K.P. Sharma Oli’s arrogance will eventually ensure total collapse of the Republican order. It is widely believed that Girija Prasad Koirala, the then President of Nepali Congress after restoration of the dead parliament by the now deposed King Gyanendra, following the India sponsored movement of 2005-2006, under RAW instructions had appointed Singh as the member of the parliament. Singh who is now an elected member of the parliament, rose to fame because of his involvement in the signing of India drafted 12-Points Agreement and his personal connection with Prachanda, who was then chairman of the outlawed Maoists’ Party based in Delhi. In the interview with Rishi Dhamala, Singh also claimed that Prime Minister Oli does not share good relations with neither India nor China. “Let’s not talk of the US”, so said a confident Mr. Singh. With no support from China, India and the US and amidst his growing unpopularity –result of his arrogance, whether Singh was hinting towards the possibility of K.P Oli being the last Prime Minister of the imposed Republican order is not known? Amresh Singh further claimed, in the eventuality of a system collapse either Nepal Army or an independent political entity could take over the nation’s charge. But, he rejects the possibility of restoration of monarchy. What makes him so certain on Nepal monarchy’s comeback is not known, however, what could be said that (presuming his connection with RAW is still active), the Indian regime perhaps does not want King Gyanendra to bounce back to power at least in the near future? Going back to his grand entrance into the body politics, it happened so quickly and under mysterious circumstances that analysts came to the conclusion that his long service to RAW had finally been rewarded by Delhi through Girija. The Nepali Congress leader KP Sitaula too is taken as a close friend of Mr. Singh. Most puzzling is that Narayan Kaji Shrestha- a Maoist leader too appeared in the political scene only after the 12 point agreement. He also got eventually settled in Nepali politics. This is yet another mystery. In the manner Sitaula, Singh and Narayan Kazi made their fast track entrance and also got settled in Nepali politics is indeed a puzzling phenomenon. Without India’s tacit yet full backing it is not possible? The authenticity of these mind boggling rumors though remain to be substantiated. Singh, although being close to the Maoists’ leaders- who were then residing in New Delhi, what prompted Girija to handpick Singh, question observers. And, further claim that this Girija move indeed substantiates Singh being an India man. Be that as it may, according to Singh, Prime Minister Oli will prove to be a disaster for Nepal for he now considers himself above the laws of the land. Without revealing their names, Singh even claimed that every evening after nine, PM KP Oli meets some mysterious men. Does he hint that the Indian Ambassador, M.S.Puri drops in Oli’s quarter each evening? Perhaps not! Leaving Singh’s revelations behind, let us now analyze expectations of Nepali population and repeated betrayal they have received from those leaders whom they had trusted. Natural it is for the common people to expect better but we need to understand that not all political movements bring desired changes as promised by the agents of “change”. Is the India engineered, drafted and imposed change of 2005-2006 heading towards meeting the same fate? It is equally possible that the leaders from whom we expect to bring positive changes in the country and lend our support, turn into our real enemy. They have not been able to prove through their acts that they are our real friends? The other day, at a colorful function organized by Dhurmus-Suntali (DS) Foundation, Chairman Pushpa Kamal Dahal of Nepal Communist Party publicly threatened popular public figure Madan Krishna Shrestha for criticizing the political leadership. At the program to declare construction of a grand stadium in Chitwan, Shrestha who spoke before Dahal, commenting on current affairs claimed that the political leadership was the most corrupt in the country. “Had it not been Madan Krishna Shrestha who managed to express his words in a modest way, would have greatly annoyed us”, Dahal replied. Chief Guest of the ceremony, Pushpa Kamal looked truly angry while retorting Shrestha’s “blunt” remarks. In saying so, Dahal made it clear that had it been someone else, let’s say a layman making similar assessment of the current situation would have been the target of his wrath. Perhaps the person’s fate would have been akin to those who were brutally murdered by the Maoists during the time of their India sponsored rebellion. Does this mean that the country is heading for a ruthless communist dictatorship where among other democratic rights, freedom of speech is also going to be curtailed? Symptoms are there already because reports confirm that the majority communist government is ready to present a bill in the parliament to curtail rights of the fourth state. Talking of Madan Krishna Shrestha and his partner Hari Bansha Acharya, who are nationally recognized comedians, observers vividly recall those days where they too had extended their full support to the India sponsored movement of 2005-2006. If enlightened men of the sort of Shrestha and Acharya can fall for the lies of the political leadership, then laymen are not to be blamed for trusting leaders of the likes of Pushpa Kamal Dahal and his former deputy Baburam Bhattarai. To come to the point, Shrestha and his partner Acharya, must be commended for making people to smile when the nation was undergoing tumultuous days but they equally need to be blamed for having championed for a change that had a foreign backing and also for the current state of the country. Having said that they will always be pardoned by the common men because more precious is their effort to make people smile than they taking political sides. Popularly known as Dhurmus and Suntali, Sitaram Kattel and his wife Kunjana Ghimire are appreciated more by the common men for their charity work than Shrestha and Acharya, this much is visible. Notably, the Dhurmus-Suntali Foundation is going to construct a Sports complex (Cricket Stadium mainly) soon in Chitwan district. In effect, Dhurmus-Suntali foundation is equivalent to a government where the champions are not aspirants of Prime Ministerial posts nor they expect to become the President of the country time permitting. Selfless service that they have been doing and that too all in the name of the people and the nation. While the story of trust and betrayal continues, we must not forget that every cloud has a silver lining. Not all is lost!